any gun, pistol, or rifle, with the exception of shotguns, air rifles, or B-B guns, within 5000 feet of an occupied dwelling. Shotguns, air rifles, or B-B guns within 1000 feet of an occupied dwelling. a firearm from, upon, over or across any federal or state highway or any county road or highway. a firearm within a Nevada State Park, unless otherwise designated by the Administrator. A "congested area" is a geographic location where discharge of any firearm is prohibited. Because congested areas are generally densely populated, it has a high risk of personal injury. A "restricted congested area" is a location where residents must be a minimum of 1000 feet from any occupied dwelling. In restricted congested areas, residents are allowed to discharge shotguns, air rifles and BB guns. A person is not allowed to discharge any gun, pistol, rifle or any other firearm in this area. A "non congested area" is a location where residents must be 5000 feet away from an occupied dwelling. In these areas they may shoot guns, pistols, rifles, shotguns, air rifles, bb guns, or any other firearms. Residents are encouraged to practice safe shooting in established and lawfully authorized and licensed rifle ranges, gun clubs or shooting galleries. 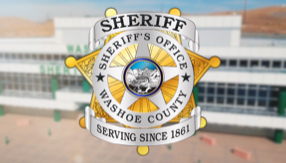 If citizens have concerns about activity that may be illegal, or dangerous, they should immediately call the Sheriff's Office at 775-785-WCSO (9276). For more information, residents can refer to the Sheriff's Office website: washoesheriff.com and click on the Congested Area Map. The link will provide them with the Washoe County Code, Chapter 50, and a live map highlighting restricted areas.